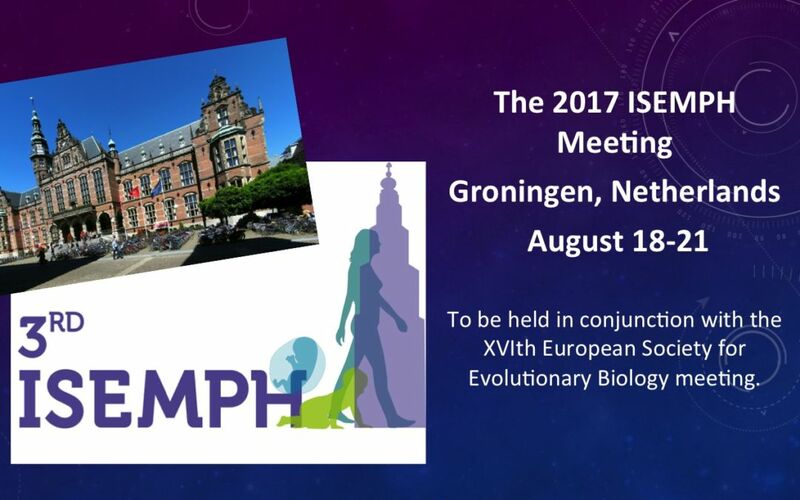 Join us in Groningen for the 2017 ISEMPH Meeting! The Third Annual Meeting of the International Society of Evolution, Medicine & Public Health will take place August 18-21, 2017 in Groningen, Netherlands in conjunction with the XVIth European Society for Evolutionary Biology Meeting. ISEMPH brings together scientists, teachers, clinicians, and students in the evolution and medicine community to share ideas and create new connections that will advance the field. This open meeting is designed to bridge the many different disciplines where relevant research takes place, including infectious disease, public health, genetics, anthropology, psychology, oncology, ecology, and veterinary medicine. Keynote speakers include Svante Pääbo, Linda Partridge, Stephen Stearns, Marian Joels, Mervyn Singer, Sylvia Cremer, Francisco Ubeda, and Peer Bork. Details at the ISEMPH Website. Submit your abstract now…and certainly before the February 15 deadline. The first two days of the ISEMPH Annual Meeting will be at the University of Groningen Medical Center, the Monday sessions will be at the Groningen Conference Center in conjunction with the European Society for Evolutionary Biology Annual Meeting August 21-25 (separate registration and abstract submission is required). Registration for both meetings will open in February. We anticipate discounted registration fees for those who attend both meetings. If you have an idea for a special symposium, round table or other creative experience, please send a note to nicole.bender@iem.uzh.ch. She and Program Committee Chair Frank Rühli are working with 12 other committee members to create a program unmatched in the history of our field.